Home > B2B Blog > Emotional Engagement: New Idea or Just Common Sense? Emotional Engagement: New Idea or Just Common Sense? It’s all the rage, everyone is talking about it; emotional engagement with B2B customers. Emotional engagement is nothing new, it has been a hot topic in the consumer world for some time. The big brands can be seen striving to engender feelings of belonging and attachment to their brands by creating and communicating experiences which foster positive emotions. 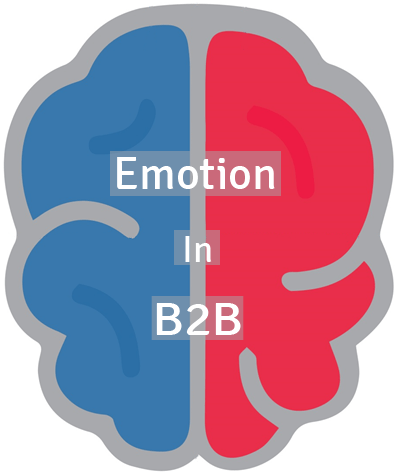 B2B decisions are not emotional – discuss! This is not the stuff of the business decision maker though…. Or is it? The basic assumption has always been that decision making in business is rational; rooted in facts and figures and logical deduction, and down to business value. It is this very assumption that has increasingly been challenged. Business buyers are people, and wherever there is a human involved it will be personal. Backed up by research carried out by both Gallup and Google & CEB, it found that personal value has twice the effect of business value across a broad range of commercial outcomes. Personal value can be in the form of self-benefit (e.g. pride), social benefit (such as popularity, professional benefit (such as career advancement) and emotional benefit (such as confidence). The research also found that, compared to consumer decision making, B2B decision making is actually more emotional; B2B customers feel both positive and negative emotions about their experiences with suppliers more strongly than consumers do. When making business decisions, 90% will choose one of those suppliers that they initially thought of as potential suppliers. Behavioural economics comes into play here; fast, intuitive and low effort “system 1” behaviours are playing a strong role in decisions, even if the slower, more rational “system 2” behaviours are later brought into play (e.g. through searching for other suppliers and evaluating them against functional or performance criteria) before coming back to the original decision. “Top of mind” awareness really is critical, and top of mind awareness is strongly driven by an emotional connection, itself driven by something which makes it easy for people to engage with; a story, lived values, a persona. This emotional message needs to be sustained throughout the purchase process. B2B sellers have tended to address buyers’ interest in products and prices only; witnessed by the organisation of their websites. Normally based around products and services on offer, this does little to create an emotional connection beyond a feeling of security in product performance, something which is often not unique, especially where commoditised products are concerned. Emotionally engaged customers deliver a 23% premium over average customers, thus, if all marketing is based on a rational decision making model and 85-90% of decision making is actually emotional, there is a danger that marketers are missing a trick. Creating a persona for the brand and reflecting this in all customer experiences will ensure customers have experiences which are worth raving about and which will be demonstrated in revenue, pareto and customer engagement scores. How do you ensure your customer experience delivers emotional engagement? Let us know in the comments section below.